You know the movie where Bill Murray keeps repeating the same day over and over? Well, folks in the Mid-Atlantic may feel a little like that thanks to a persistent weather pattern. The main storm track has been parked over the Mid-Atlantic for the past two weeks, bringing daily doses of precipitation to that region. In fact, Washington National, DC set a new record for their greatest number of consecutive days with measurable precipitation (at least 0.01 inches). 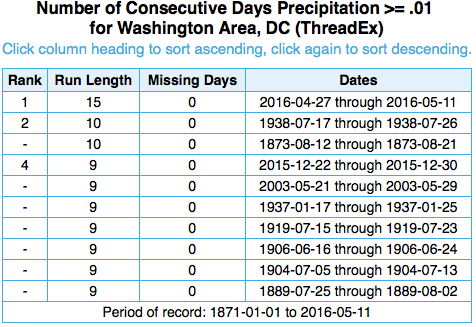 Washington National, DC’s previous record for consecutive days with measurable precipitation was 10 days, which occurred in 1873 and 1938. The site’s record for consecutive days with at least a trace of precipitation is 17 days. This record may also be broken or at least tied as a chance of precipitation is in the forecast through Saturday (May 14th). Washington Dulles, DC already broke their record for consecutive days with at least a trace of precipitation. The site had 16 such days from April 26-May 11. The old record was 13 days set in 1972 and 1989. Baltimore, MD has had 15 days in a row with at least a trace of precipitation. The site’s record is 18 days, set in 2003.